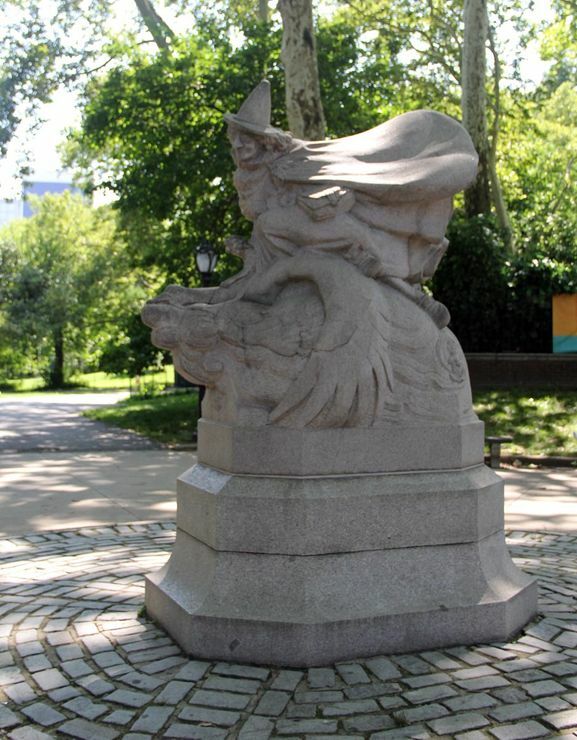 The Department of Parks announces that an interesting statue depicting famed characters of the Mother Goose series of fairy tales, has been erected in the circle at the entrance to the Mary Harriman Rumsey children's playground in Central Park, Manhattan, formerly the site of the old Casino. The statue consists of a large figure of the witch who is astride the goose's back; then on the east and west sides in bas-relief there are figures of Humpty Dumpty, Old King Cole, Little Jack Homer, Mother Hubbard, and Mary and Her Little Lamb. This amusing piece of statuary was carved out of a thirteen ton piece of Westerly Granite by W. P. A. craftsmen, working under the jurisdiction of the Park Department. It was conceived and designed by Frederick G. Roth, who also designed and executed the carved group of "Alice in Wonderland" characters in the Sophie Irene Loeb Memorial erected in the Heckscher Playground in 1936. New York City Parks Department press release of June 17, 1938.